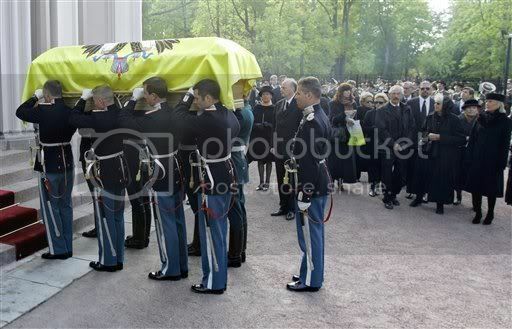 Crown Prince Frederik sprinkles Danish soil upon the coffin of Empress Maria Feodorovna. The soil is from Empress Dagmar's rose garden at her house in Hvidøre in Denmark where she spent her final years - it was a garden she tended herself. 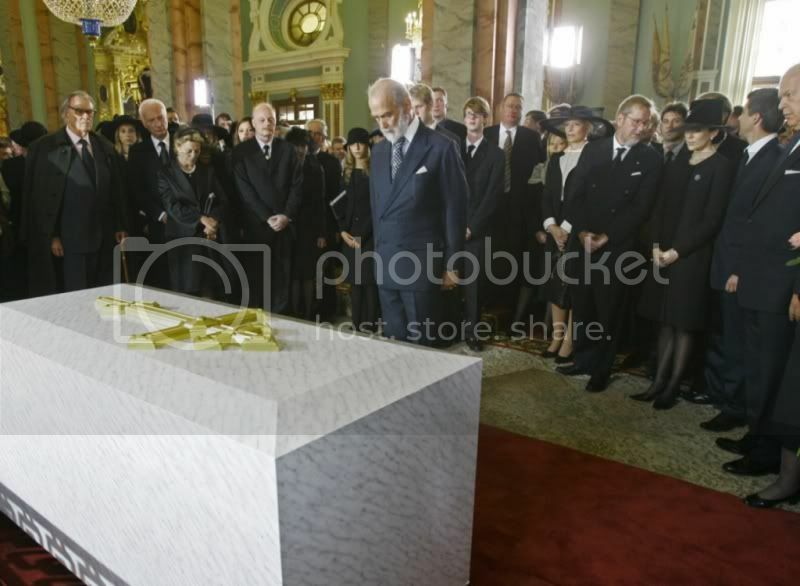 It was Queen Margrethe's idea that Danish soil from Dagmar's beloved rose garden should be enclosed with her in her final resting place in the Saints Peter and Paul Cathedral, now beside her husband and near the remains of her son the last Tsar Nicholas II and his family, and other members of the Imperial Family. 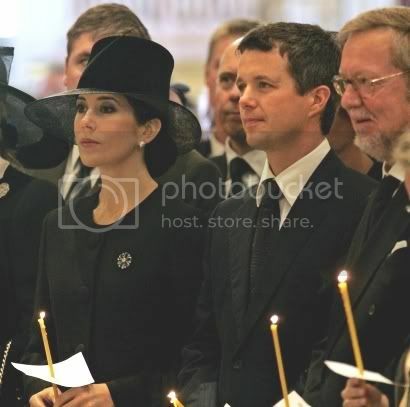 Crown Princess Mary and Crown Prince Frederik in St Isaac's Cathedral, St Petersburg. 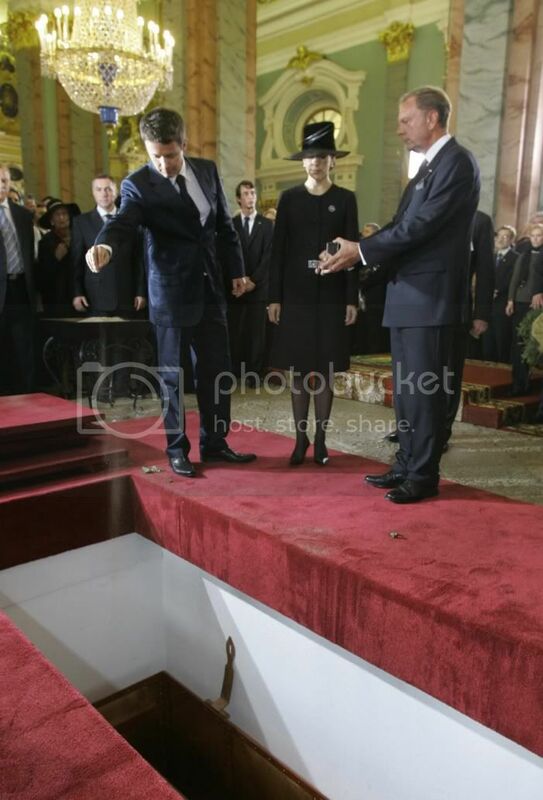 Today Crown Prince Frederik and Crown Princess Mary have been involved in the reburial ceremony at St Isaac's Cathedral along with other dignitories. 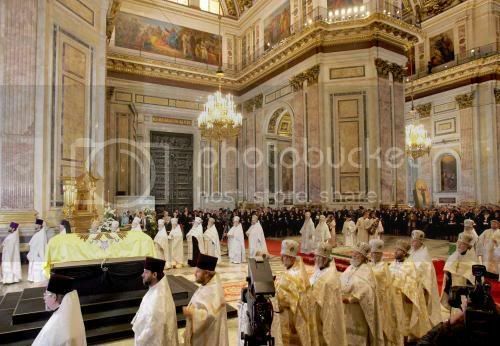 Representatives from Europe's royal families were in St Petersburg's largest cathedral, attending the re-burial service for Empress Maria Feodorovna. Her coffin was carried by a guard of honour on her return to the ancient imperial capital 87 years after she left. Born in Denmark, Maria Feodorovna was the wife of Tsar Alexander III and the mother of Russia's last emperor Nicholas II. She fled the country during the revolution, after her son was shot by a Bolshevik firing squad. She died and was buried in Denmark, at the age of 80. The Patriach of the Russian Orthodox Church has described the return of her remains as an act of repentance for the state and a historic and spiritual event for Russia. Maria Feodorovna will be laid to rest in the imperial crypt at the cemetery of the Peter and Paul Fortress, alongside her husband and son. 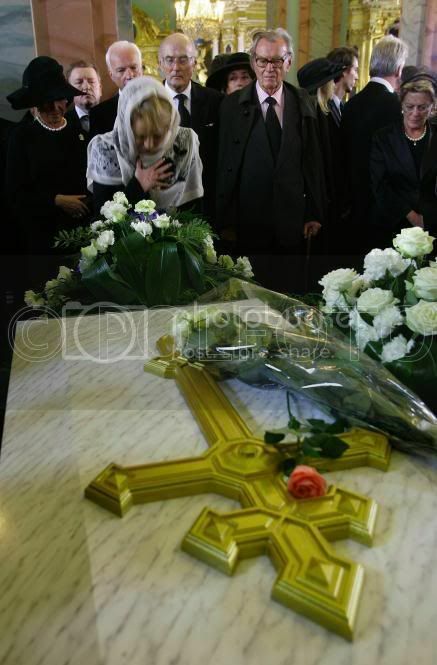 She is the only ruler from the Romanov dynasty not buried there, and now she will probably be the last. Relatives say it was her dying wish to be buried with her family. Berlingske Tidende (in Danish) reports Crown Princess Mary took a break of 10 minutes during the ceremony in St Isaac's Cathedral. 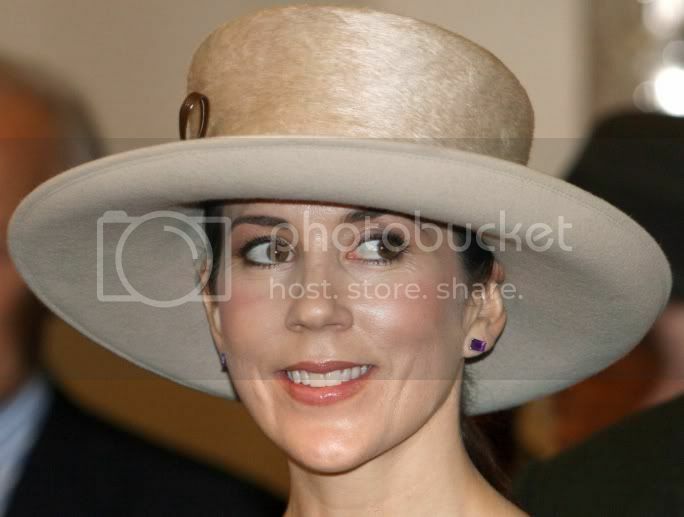 Yesterday, Crown Prince Frederik and Crown Princess Mary attended a reception aboard the Danish ship 'Ebsen Snare' to mark the reburial of the Empress Maria Fedorovna. 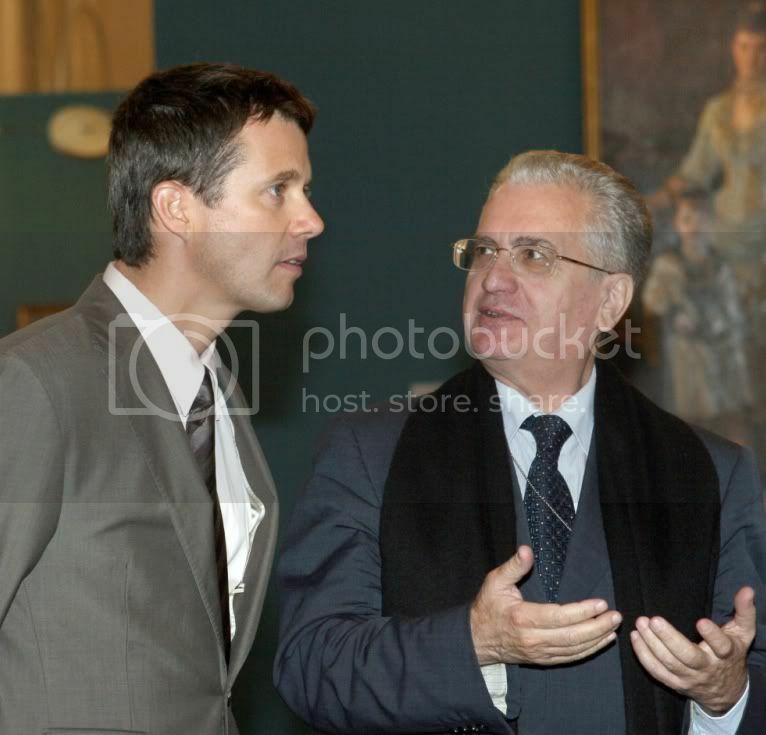 Today, Crown Prince Frederik and Crown Princess Mary attended the opening of an exhibition by Danish court painter of XIX century, Lauritz Tuxen, at the State Hermitage museum in St. Petersburg. The Danish royals arrived in St. Petersburg to take part in a reburial ceremony of the Russian Empress Maria Fedorovna, former Danish Princess Dagmara, which married Russian Emperor Alexander III and escaped Russia after the October Bolshevic revolution and died in Denmark. 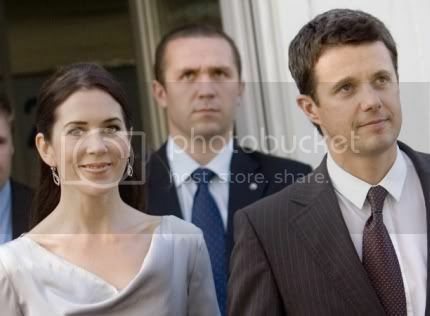 Crown Prince Frederik and Crown Princess Mary have arrived in St Petersburg Interfax Russia has reported. B.T. reports that Prince Michael of Kent will represent Queen Elizabeth and King Constanine and Queen Anne-Marie of Greece will attend the ceremonies. ST.PETERSBURG. 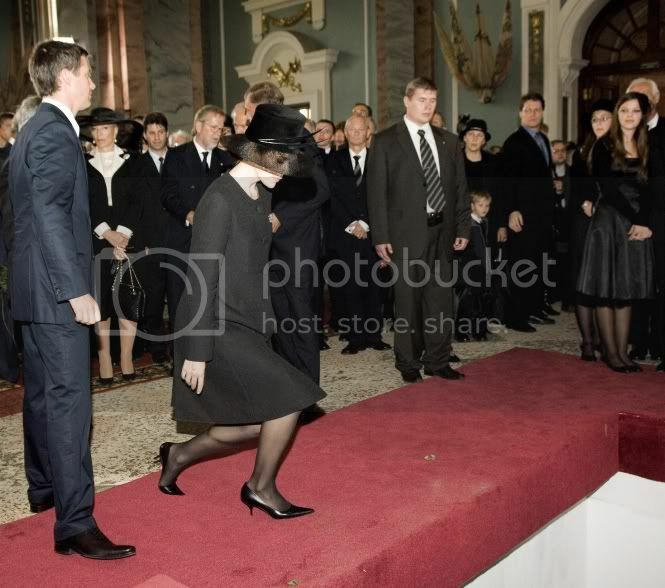 Sept 27 (Interfax) - Crown Prince Frederik and Crown Princess Mary of Denmark arrived in St.Petersburg on Wednesday morning to attend the reburial ceremony of Empress Maria Fedorovna's remains, Russian Culture Minister Alexander Sokolov told the press. 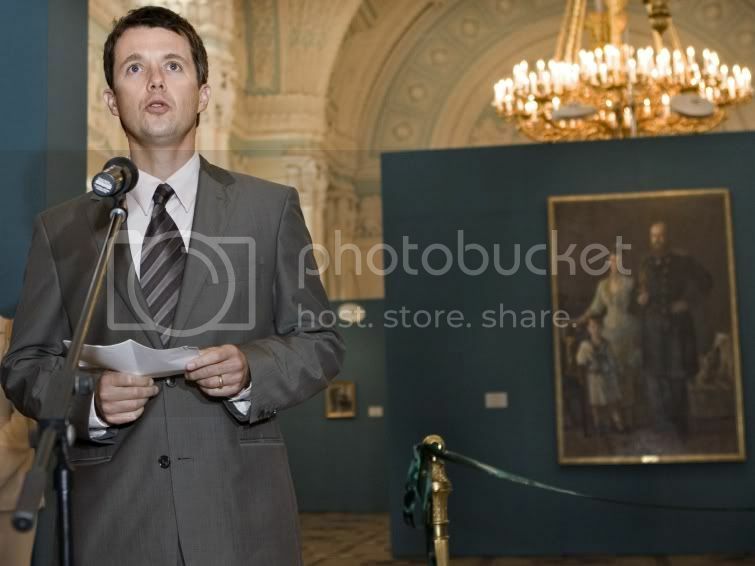 The Crown Prince will open an exhibition at the State Hermitage Museum, entitled "Lauritz Tuksen, a court painter. Works from Danish and Russian collections" on Wednesday. The Crown Prince will also give a reception on his ship. 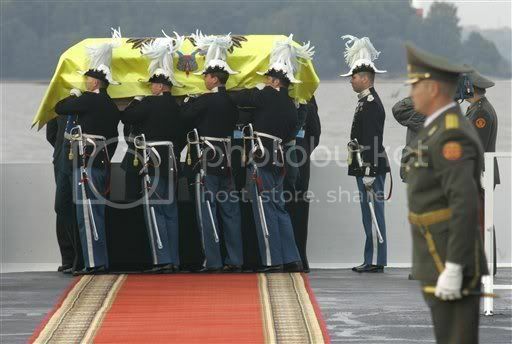 Russian and Danish honor guards carry a coffin with remains of Czarina Maria Fyodorovna in Petergof, outside St.Petersburg on Tuesday, Sept. 26, 2006. The remains of Czarina Maria Feodorovna were brought Tuesday to Russia for burial from Denmark, the country where she was born and died. Maria Feodorovna was the wife of Czar Alexander III and the mother of Nicholas II, who fell to the Bolsheviks in 1917. 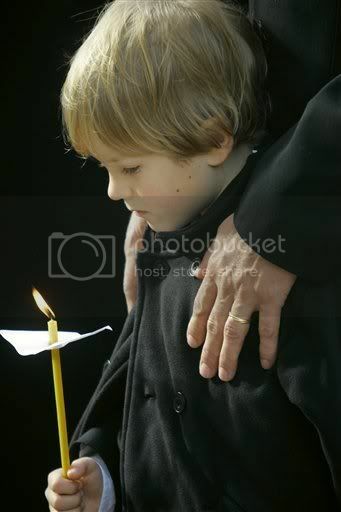 The Romanov's include Nikolai Romanov, Dmitry Romanov, Sebastian Romanov (little boy with the candle), Rostislav Romanov, Nikita Romanov and ordinary people paying their respects at the coffin. To non-Danes, the name Princess Dagmar probably means nothing: the great-great-aunt of the reigning Queen Margrethe died in 1928 in her suburban Copenhagen villa to be buried in Roskilde Cathedral. On the other hand, mention the Empress Maria from Disney's animated Anastasia (as voiced by veteran star Angela Lansbury), and there may be more than a few nods of recognition. In fact, unlike the Anna Anderson-Anastasia mystery, there's no doubt here that Dagmar and Maria are one and the same person. 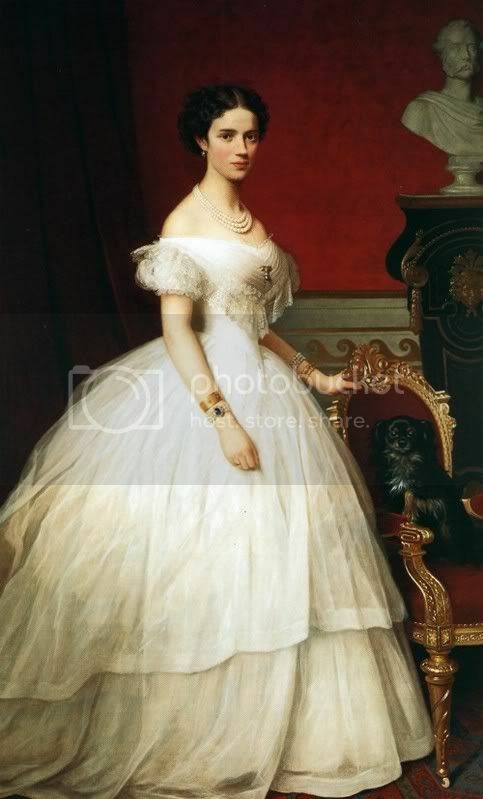 How the plainly aristocratic Glucksburg that was Princess Dagmar of Denmark came to be known as the Empress Maria Fedorovna is one of those fairy tales of history to which, however, there was no happily ever after. Instead, a Bolshevik revolution is to blame for her somewhat inauspicious end in Hvidøre in what is now Copenhagen's Whiskey Belt. Princess Dagmar's parents, King Christian IX and Queen Louise, matched her with Tsarevich Nicholas Alexandrovich, heir to Tsar Alexander II. When Nicholas died of bronchitis in 1865, however, Dagmar was betrothed again to his brother, Grand Duke Alexander Alexandrovich. In 1866, she set sail from Denmark to join the Russian royal family. With a speed and efficiency to be admired, Princess Dagmar mastered the notoriously difficult Russian language and was baptised in the Russian Orthodox faith, recreated as Maria Fedorovna. Married in St Petersburg in 1866, there was little trace of simple, vivacious Dagmar in the imperial court of Maria Fedorovna; if her enthusiasm for mastering the language was impressive, it was nothing compared to the way she threw herself into the sumptuous consumption of one of the world's most decadent and glamorous societies of the time. History as well as Hollywood warns us, though, that a life of luxury does not last, and Maria Fedorovna's offspring were to be some of the last members of the Romanov dynasty. She and Alexander (known as 'the bear') had six children, of which five survived infancy. Two things happened in November 1894: first Tsar Alexander III died of nephritis, forcing his son Nicholas to take his place, and less than four weeks later he married Princess Alix of Hesse and by Rhine, (who became Alexandra) who had been brought up under the strict guidance of British grandmother Queen Victoria. As Nicholas and Alexandra's devotion to each other began to alienate them from the rest of their family, this imperial rift only added to the rising instability within Russia. Alexandra had four beautiful daughters, but no heir: the son finally born in 1904 had haemophilia - a hereditary condition known as the 'royal' disease. Grandmother Maria, having grown estranged from her beloved son, immersed herself into St Petersburg society, charity work and travelling. She also had a yacht, the Polar Star, which she summered on. This was to change with the Bolshevik revolution of spring 1917, plunging Russia into civil war and leading to the execution of Nicholas, Alexandra and their family in 1918 and brother Michael a little later. Maria Fedorovna left the country for the final time with what remained of her family in 1919 onboard the British ship HMS Marlborough, which stopped first in Malta before docking in England. Maria stayed first with her sister's family there but was not suited to playing second fiddle and returned to her roots in Denmark. Right up until her death, it appeared her life had frozen with the revolution, from her Hvidøre villa, she waited quietly for a sign her sons and grandchildren had somehow survived. Empress Maria was buried in Roskilde Cathedral in 19 October 1928 alongside other members of the Danish royal family, but according to family members she always harboured a desire to return to Russia to lie beside her husband. 'It was her greatest wish to be buried beside her beloved husband,' said Dimitri Romanoff, who lives north of Copenhagen and is a direct descendant of Tsar Nicholas. Realising Empress Maria's dream became a possibility after the fall of the Soviet Union. 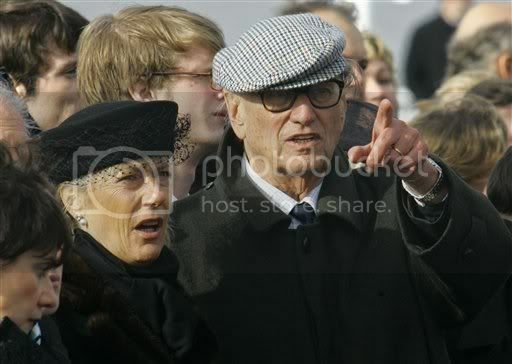 Dimitri Romanoff and his older brother, Prince Nicholas, who lives in Switzerland, noted the change in winds when the former Russian president, Boris Yeltsin, took part in the reburial ceremony for the murdered family of emperors eight years ago in St Petersburg's Peter and Paul Cathedral. After consulting other members of the Romanoff clan, Dimitri contacted Queen Margrethe in 2003 and received her approval. He then pursued the possibilities for re-internment through a chain of correspondence with Russian President Vladimir Putin. The arduous process paid off, according to Dimitri Romanoff. 'Now what we have worked for and dreamed about for years is finally happening,' he told daily newspaper Berlingske Tidende. 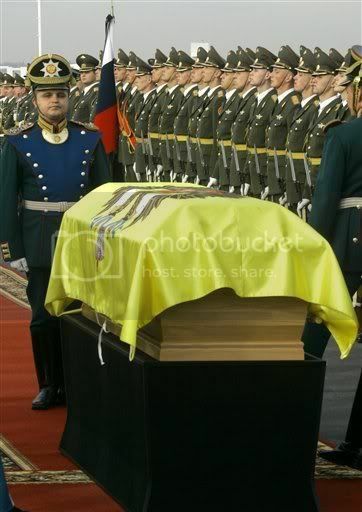 The re-internment ceremony which began last week essentially retraced the funeral of Empress Maria 78 years ago. First, a ceremony was held in Copenhagen's Russian Orthodox church, Alexander Nevsky Church, on Friday, followed by a memorial service in Roskilde Cathedral on Saturday. Queen Margrethe and other members of the Royal Family attended, as well as representatives of the Danish government and parliament, together with representatives of the Russian government and the City of St. Petersburg and members of the Romanov family. From Roskilde Cathedral, the body of Empress Maria was transported to Christiansborg, the seat of the Danish parliament, where a horse-drawn carriage awaited and transported her through Copenhagen to the naval vessel Esbern Snare. From the Copenhagen harbour, her body set sail for St Petersburg once again, following the same route she travelled to meet her coming husband. 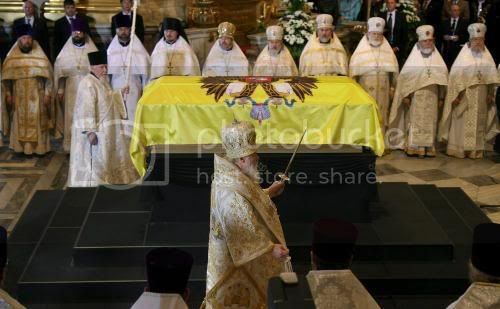 Upon landing in St Petersburg on Tuesday - the same place where she placed foot on Russian soil for the first time 140 years ago - the body of Empress Maria was received by an emotional governor of St Petersburg Valentina Matvienko. 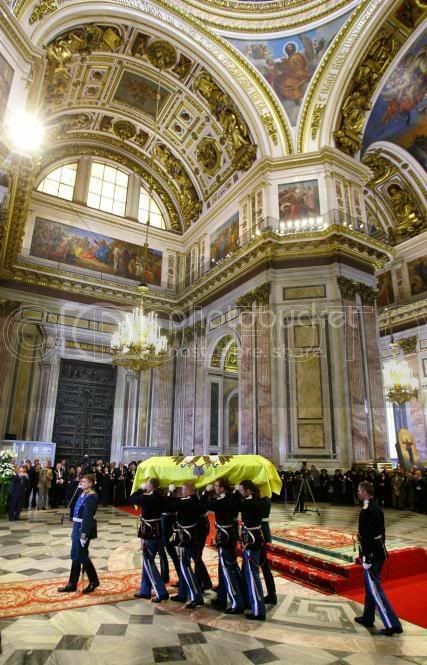 An honour guard of Russians and Danes brought her body to a chapel at Peterhof, the royal palace south of the city. Here, visitors could pay their respects to their returned Empress until the official re-internment ceremony on Thursday. Danish dignitaries attending the ceremony on Thursday will include Crown Prince Frederik, Crown Prince Mary, and the minister of foreign affairs, Per Stig Møller. 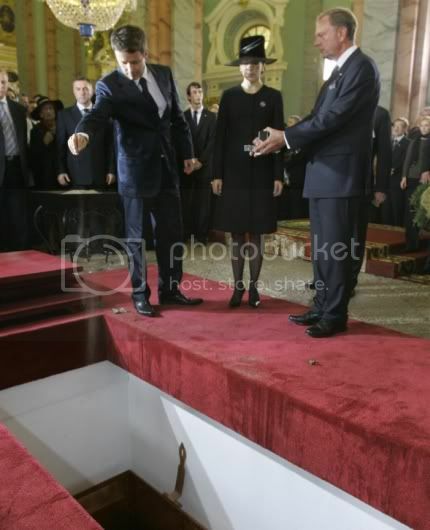 Crown Prince Frederik brought a silver case filled with soil from Empress Maria's garden in Hvidøre. For Russians, the return of their empress takes on symbolic meaning for a country trying to come to terms with its imperial past after more than seven decades of communist rule. Today the Esbern Snare arrives in St Petersburg and Crown Prince Frederik and Crown Princess Mary arrive tomorrow. It is uncertain whether President Vladimir Putin or Prime Minister Anders Fogh Rasmussen will attend - so far it looks as if the frosty relationship between Russia and Denmark in recent times will mean they do not attend. Neither is the Queen attending because there are various protocol issues to do with state visits and other issues between the two countries. 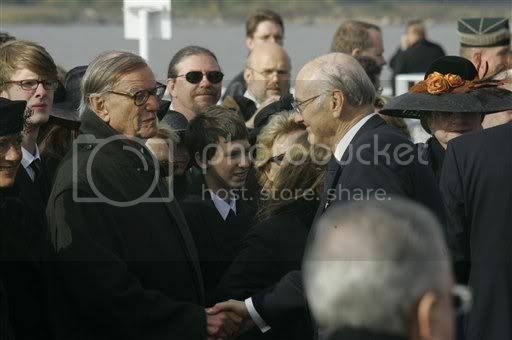 The organisation of the reburial and Frederik's and Mary's visit represents a thawing of relations, so interesting times at various levels. The reburial program in St Petersburg is designed to emphasise the first journey the then Princess Dagmar took on arriving in Russia 140 years ago to the day. Before marrying Alexander, Dagmar converted to Russian Orthodoxy and took the name Maria Feodorovna Romanova upon marriage. Russia became beloved to her. Before being evacuated in 1919 Maria Feodorovna worked (with her daughter Olga) for the Red Cross helping the Russian soldiers who were fighting in the Crimean war. Other historical tendrils: as Dowager Empress she knew Rasputin and knew how damaging he and Nicholas II's wife Alexandra were to the future of the Imperial Family. She is said to have never really been 'right' about the murder of her family, understandably enough, this would be a very difficult thing to be reconciled to. At 8 a.m. the coffin of Empress Maria Feodorovna on board the Danish navy vessel Esbern Snare will pass Kronstadt at the entrance to St. Petersburg. 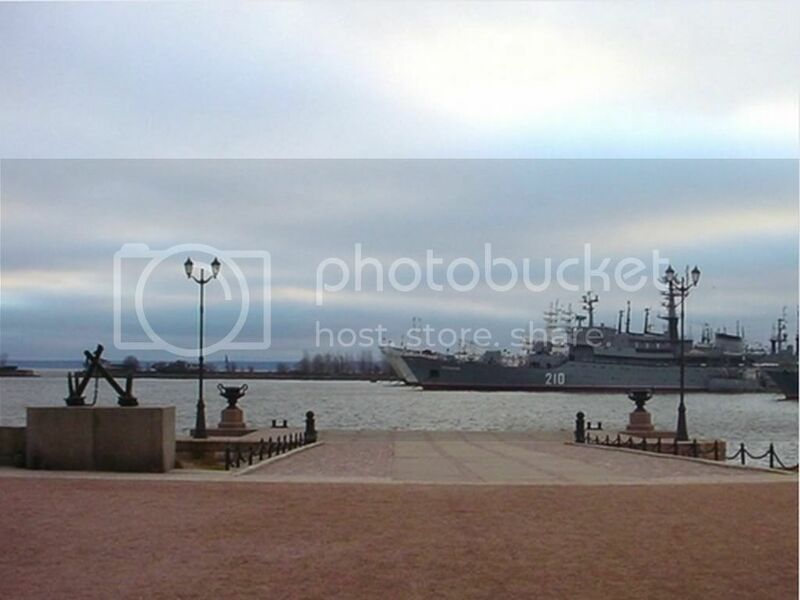 From Kronstadt the vessel will be saluted. After this Esbern Snare will arrive at the Vasilevsky Island, where the coffin of Empress Maria Feodorovna will be transferred to a Russian vessel. 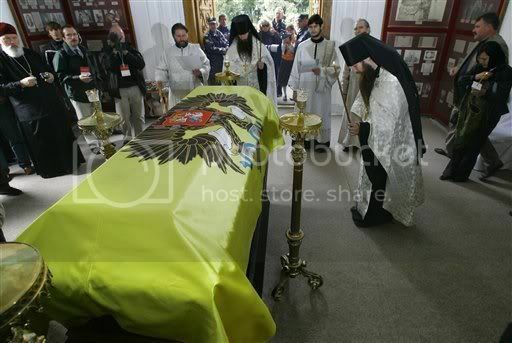 which will carry the coffin to the Peterhof Castle outside St. Petersburg. Later that day Esbern Snare will proceed to the centre of St. Petersburg and call at the bank of the Neva. 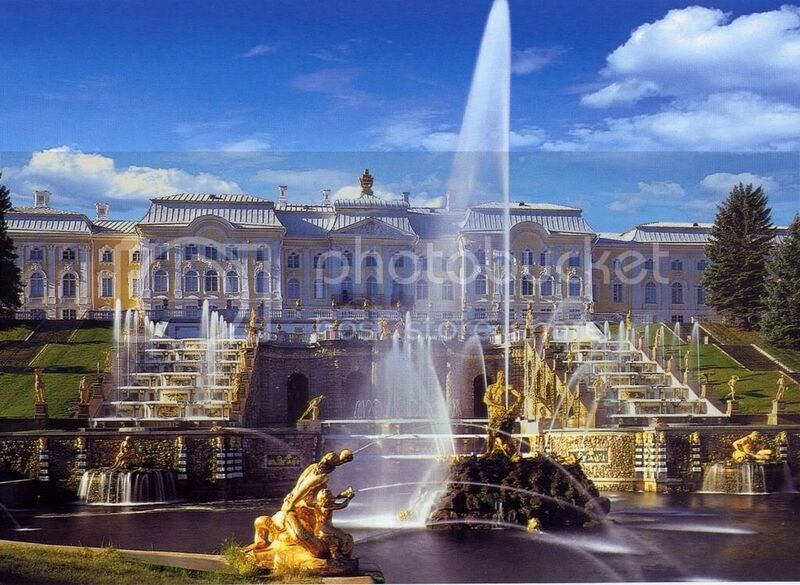 At the place of call at Peterhof the official reception will take place in presence of the Governor of St. Petersburg. The Danish-Russian Honour Guard will bring the coffin ashore. 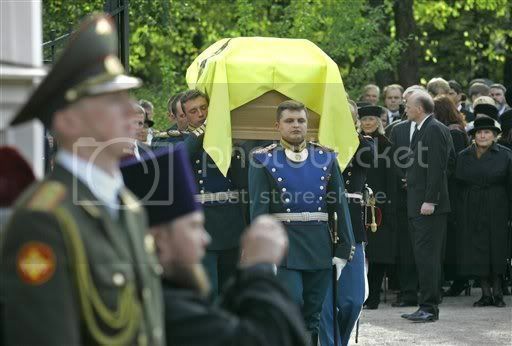 The coffin will be brought by hearse to the nearby Alexander Nevsky Chapel in the Alexandriya Park at Peterhof. 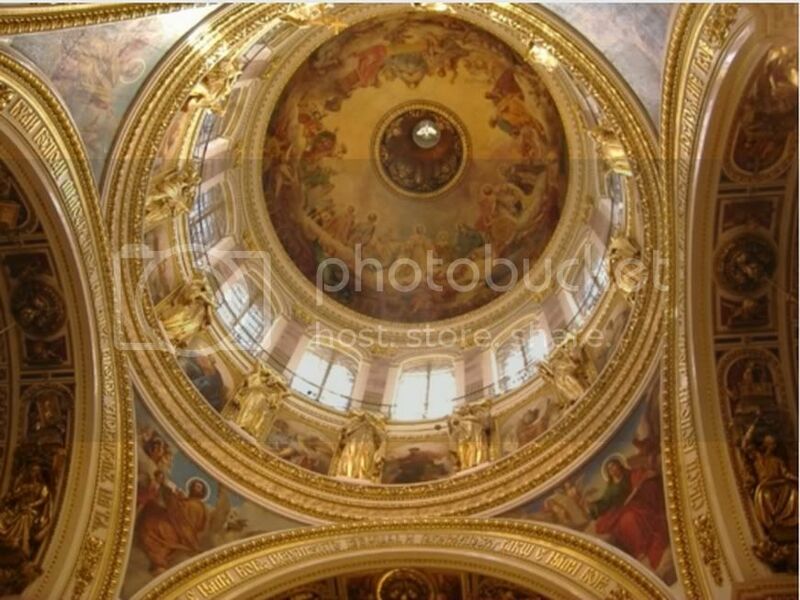 By noon the ceremony will end with a short service in the Alexander Nevsky Chapel. In the afternoon the Alexander Nevsky Chapel will be open to the public. 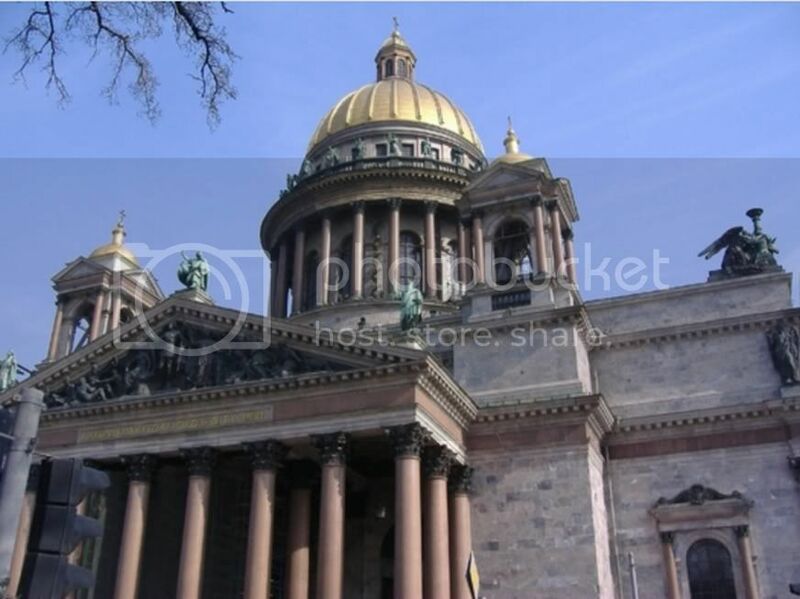 In the daytime the Alexander Nevsky Chapel will be open to the public. The Crown Prince Couple and Danish Foreign Minister Per Stig Møller will arrive in St. Petersburg. 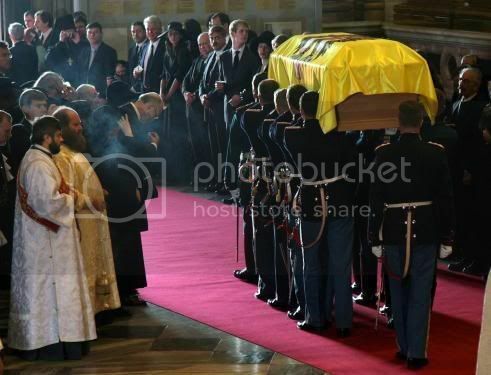 In the morning the coffin of Empress Maria Feodorovna will be carried out of the Alexander Nevsky Chapel by the Danish-Russian Honour Guard. 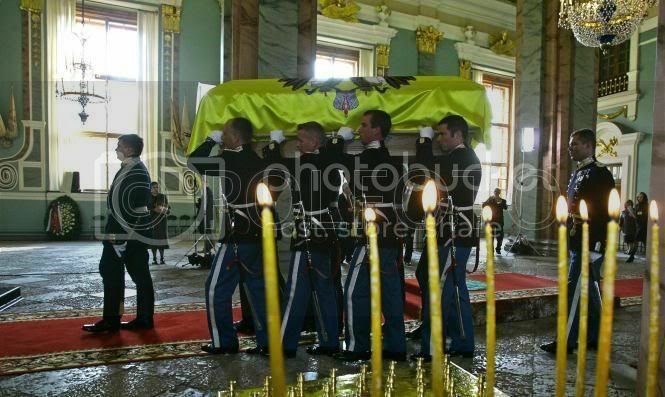 The coffin will be transported by motorcade via the Catherine Palace in Tsarskoe Selo to St. Petersburg. 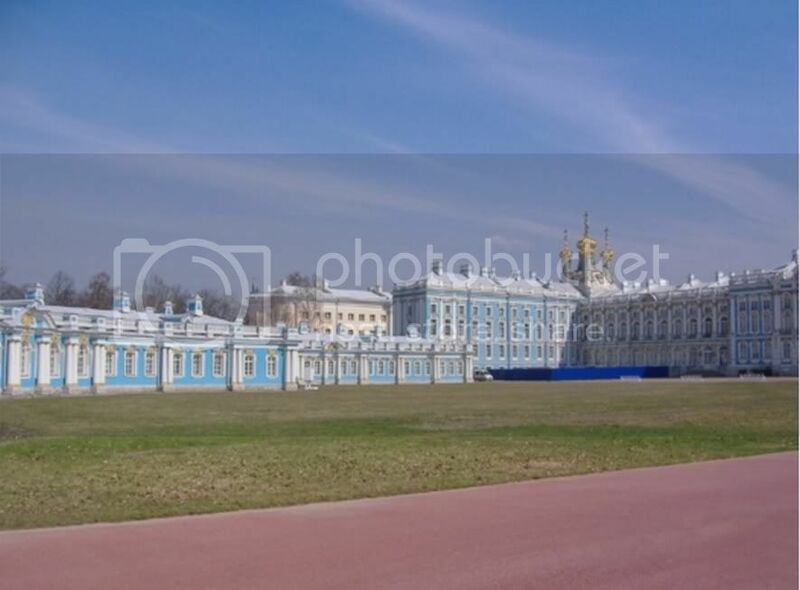 There will be a short ceremony on the parade-ground of the Catherine Palace. Tsarskoe Selo is yet another magnificient summer residence of the Russian Tsars situated approximately 20 km to the south of St. Petersburg. Peter the Great presented the area as a gift to his wife, who later became Catherine I, and the palace was named “Catherine Palace”. 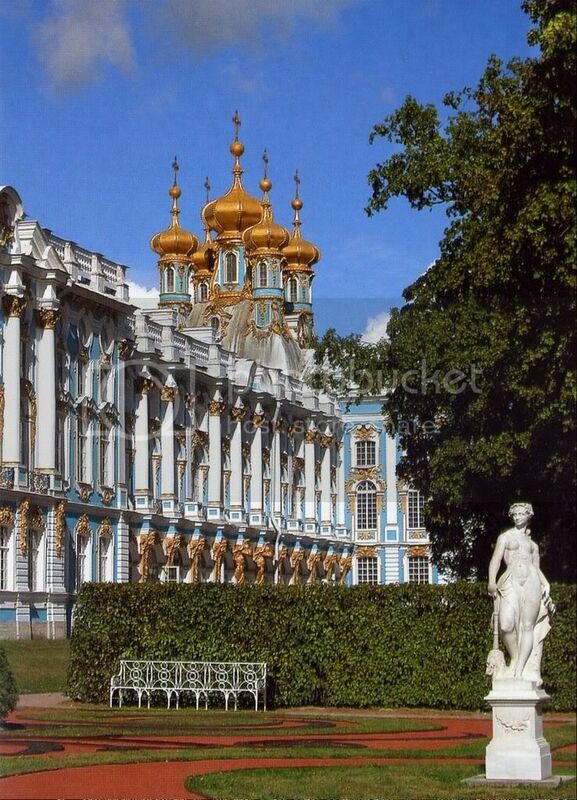 The palace was in its prime under Catherine the Great (II) towards the end of the 18th century. The Catherine Palace, which is surrounded by a large park (3000 hectares), is especially known for its unique amber chamber. It was removed by the Germans during the Second World War and has not been recovered. The amber chamber was recreated on the occasion of the 300 year anniversary of St. Petersburg in 2003 thanks to a donation from the German company “Ruhrgas”. Also the Danish company, “Velux”, supported the restoration of amber effects of both Danish and German origin from the original Amber Chamber. On her way to St. Petersburg from Peterhof in 1866 Princess Dagmar paid a visit to Tsarskoe Selo and the Catherine Palace. 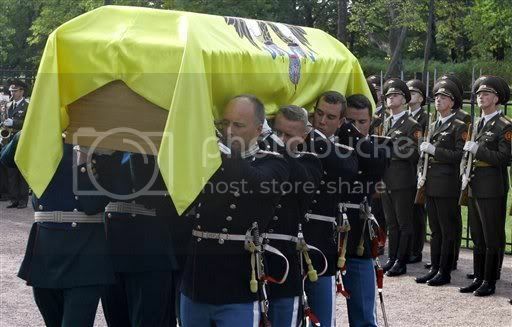 The reburial cortege will take the same route. 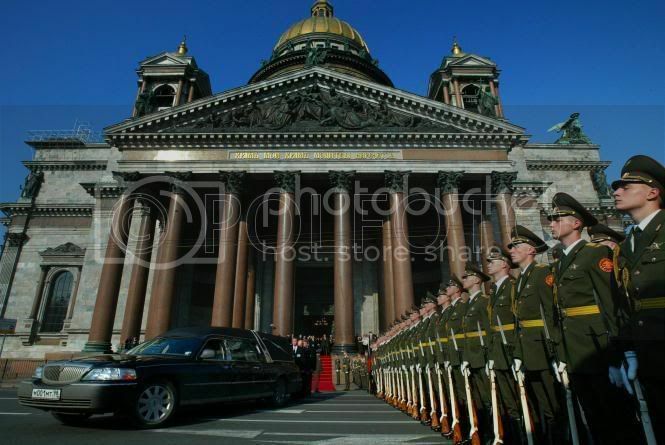 The motorcade arrives at St. Isaac´s Cathedral, where the Danish-Russian Honour Guard will carry the coffin into the cathedral. At noon a service will be held in St. Isaac´s Cathedral conducted by His Holiness Patriarch of the Russian Othodox Church, Alexey II. The Crown Prince Couple, the Danish Foreign Minister Per Stig Møller and the Danish delegation will participate in the service and in the following reburial ceremony. 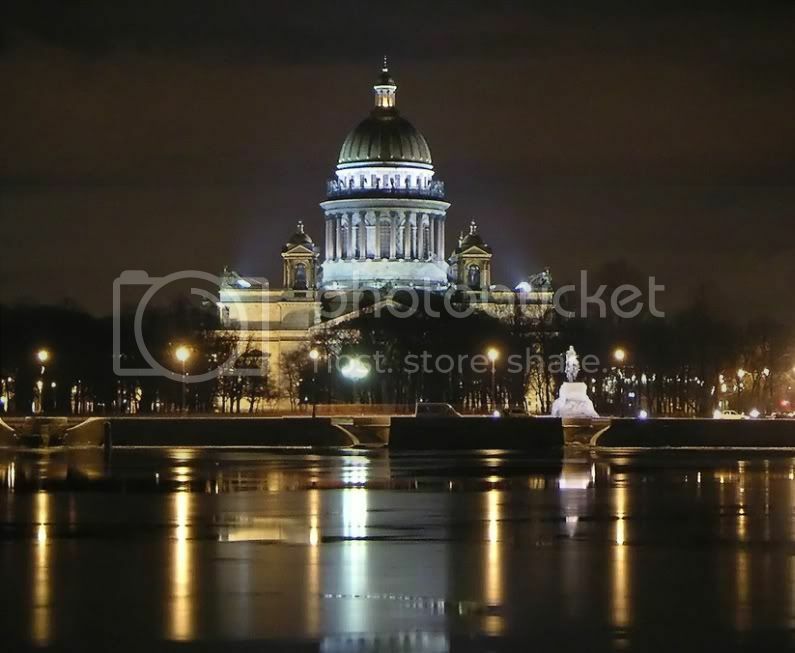 St. Isaac´s Cathedral has the fourth biggest dome in the world after St. Peter’s Cathedral in Rome, St. Paul’s Cathedral in London and Maria del Fiori in Florence. The cuppola is 22 m. in diameter. The 101 m. tall cathedral can accommodate 7,000 visitors. The present building with its 17 m. tall and 114 tons heavy monolitpillars was constructed over a period of 40 years (from 1818 to 1858). 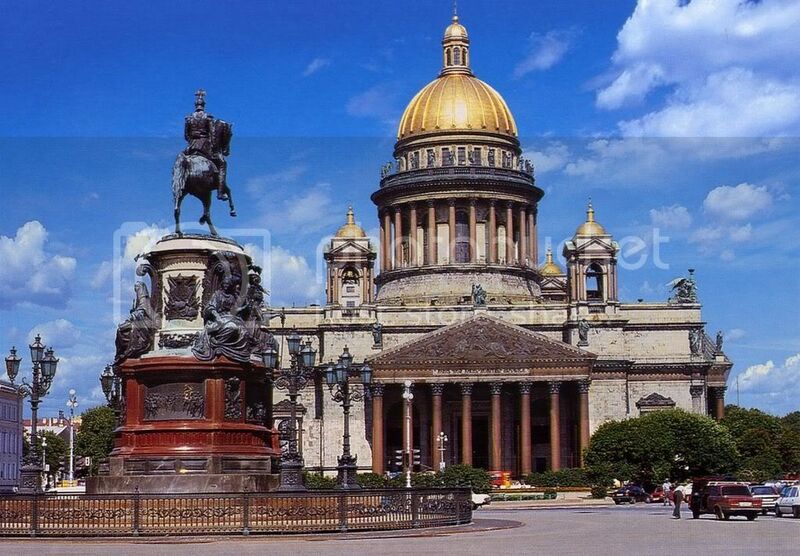 It served as the dome of St. Petersburg till 1937, when the cathedral was no longer used for services. From then on the cathedral served as an anti-religious museum, in which the famous Foucault pendulum was displayed as a demonstration of the rotation of the earth. 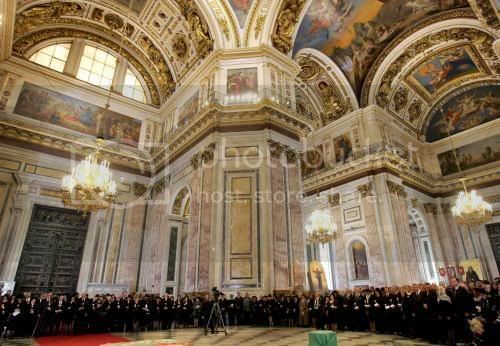 After Gorbachev’s perestroika services were again permitted to be held in St. Isaac´s Cathedral, although today the cathedral is only used for religious services on special occasions. 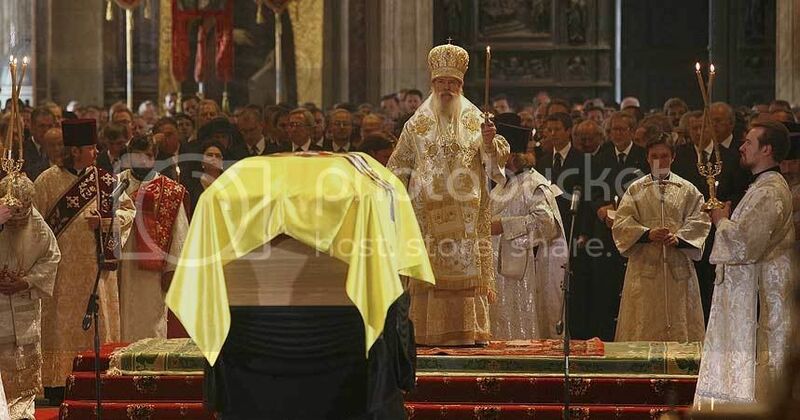 As part of the reburial the Russian Patriarch will conduct a memorial service in St. Isaac´s Cathedral on 28 September. The Crown Prince Couple will attend the reburial ceremony here. At the end of the service the Honour Guard will carry the coffin to the hearse and the motorcade will drive to Saints Peter and Paul Fortress. 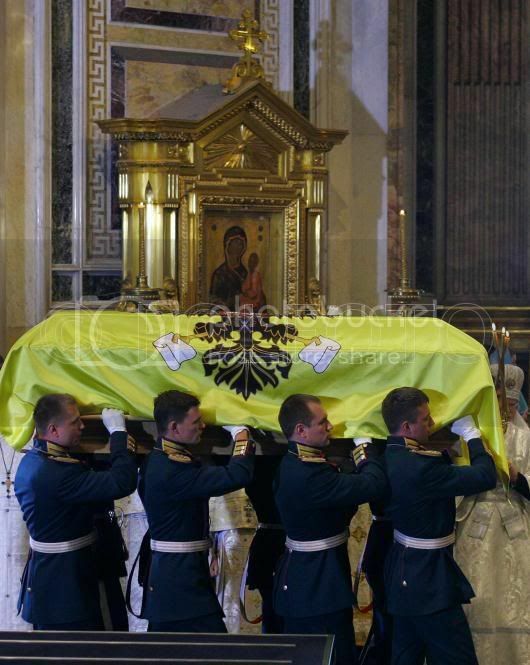 From the Petrovsky Gates the coffin of Empress Maria Feodorovna is carried in procession to the Saints Peter and Paul Cathedral. The coffin is carried into the cathedral under accompaniment by the Band of the Royal Danish Life Guards and the Russian Admiral Orchestra. 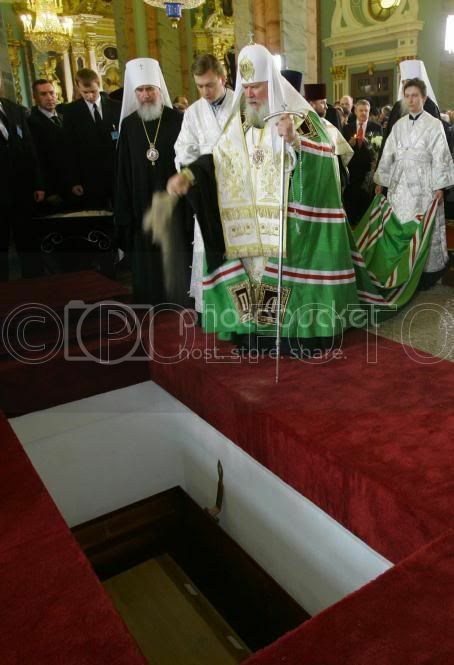 In the afternoon His Holiness Patriarch Alexey II will conduct the reburial ceremony in Saints Peter and Paul Cathedral. 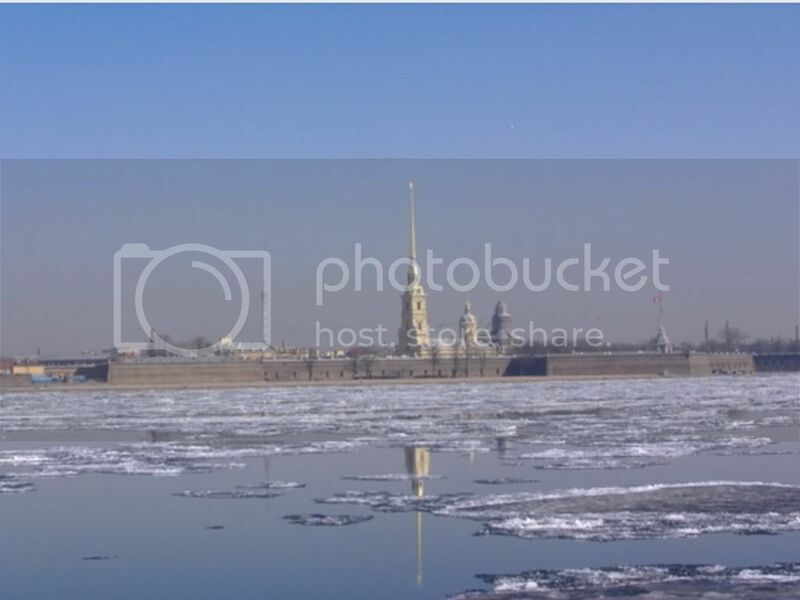 The Saints Peter and Paul Fortress is the oldest work of engineering in St. Petersburg. It was built on the Hare Island, the smallest of the 42 islands on which St. Petersburg is situated in the delta of the Neva. 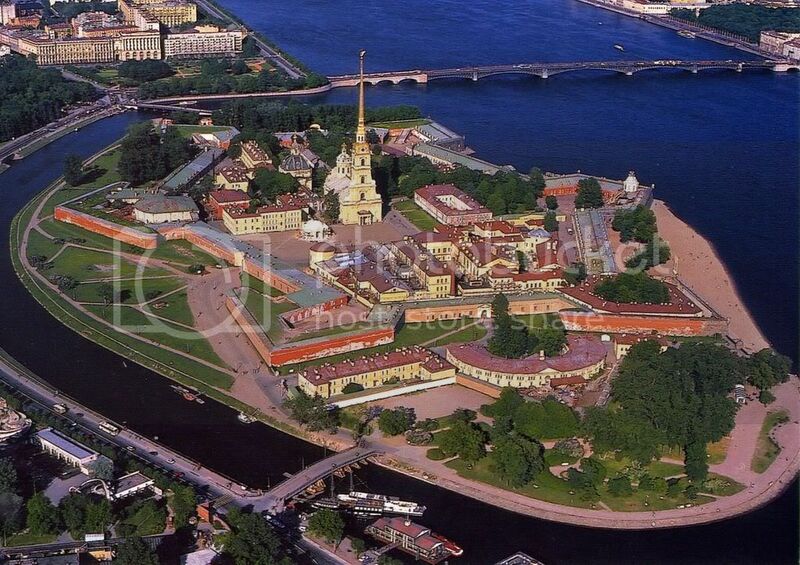 The fortress was founded on 27 May 1703 and this date is considered the birthday of St. Petersburg. 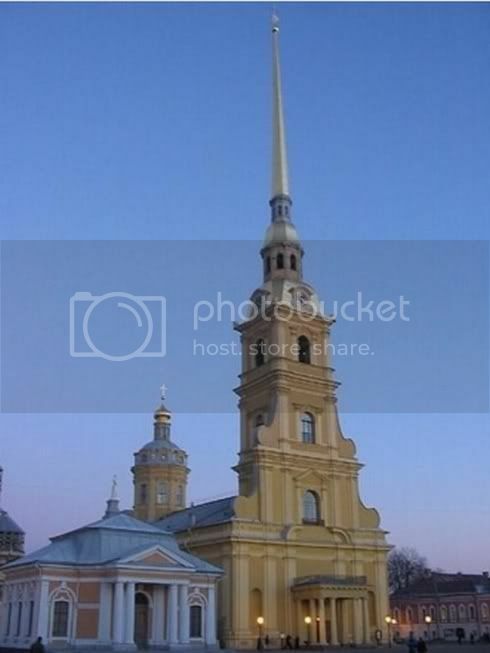 In the middle of the Saints Peter and Paul Fortress is the Saints Peter and Paul Cathedral, which was built from 1712 to 1733 by the architect Domenico Trezzini. The gilded spire, which is 122,5 m. tall, is still the tallest architechtural work in town. The Cathedral is the burial church of the Russian Tsars from Peter the Great to Nicholas II and his family, who were buried here in 1998. In the chapel known as the Grand-Ducal Vault 13 members of the Imperial Family have been buried up to 1917. 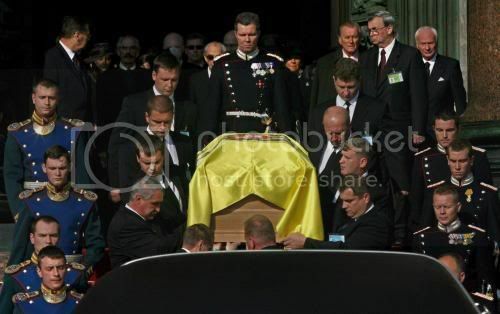 As the latest, the Grand Duke Vladimir Kirilovich was buried in the Grand-Ducal Vault in 1992. 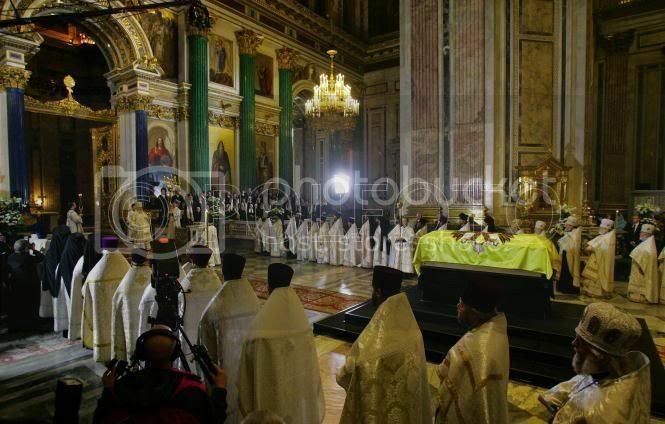 After the reburial ceremony in Saints Peter and Paul Cathedral the delegations and invited guests will meet at the Ethnographic Museum of St. Petersburg, where a memorial banquet will be held in the Marble Hall. Following a concert in the State Academic Capella in the evening the Crown Prince Couple and the Danish Foreign Minister will leave St. Petersburg. Choral singing was an institution closely linked to the Russian tsarist court, and Peter the Great had already established his own orchestra when the city was founded. The present building dates from 1889 and the concert hall seats 803 people. Today the State Academic Capella is an institution concerned with concerts, education and information. The institution has its own choir and a symphony orchestra. The Crown Prince and Crown Princess will attend a memorial concert on 28 September at the State Academic Orchestra. On 26 September the State Academic Orchestra will also be the setting for a concert with the Royal Guard Band and the Admiralty Orchestra. It was at Peterhof that the Danish Princess Dagmar on 26 September 1866 first set foot on Russian soil. When the Imperial Couple spent their summer in Peterhof, they mostly stayed in a “cottage” in the Alexandria Park adjacent to Peterhof. 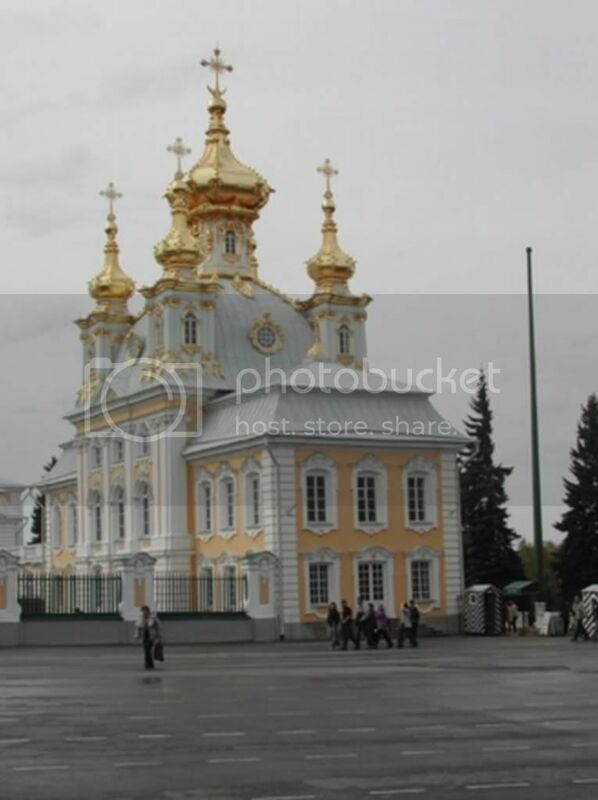 The nearby Alexander Nevsky Chapel (“the Gothic Chapel”), where Empress Maria Feodorovna’s coffin will be on display until 28 September, served as the couple’s private church during their stays at Peterhof. The “Cottage” is now a museum and is open to the public. Among other items it contains a collection of Danish porcelain. 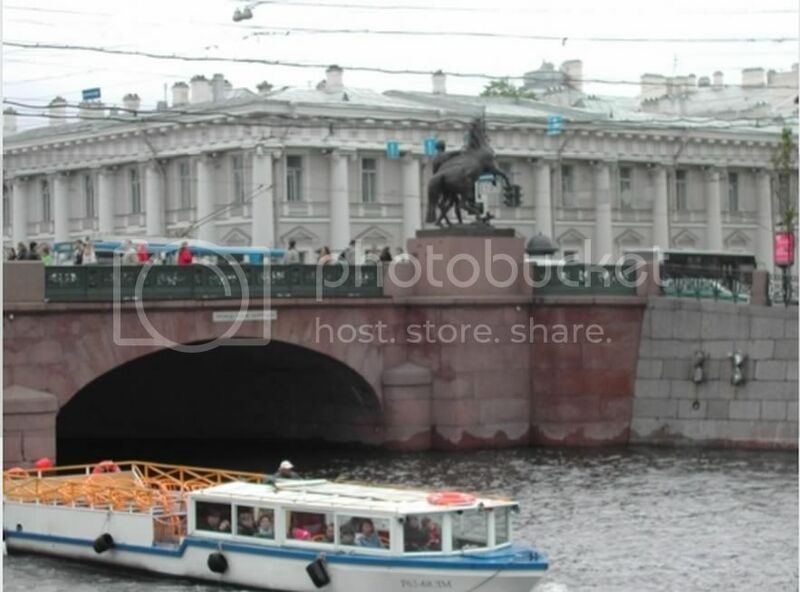 Anichkov is among the original stone buildings erected along the Nevsky Prospekt (dating from the middle of the 18th century - see both photos for different views of the building) at the Fontanka River. The Palace was the setting for a significant part of Empress Maria Feodorovna’s life in Russia. 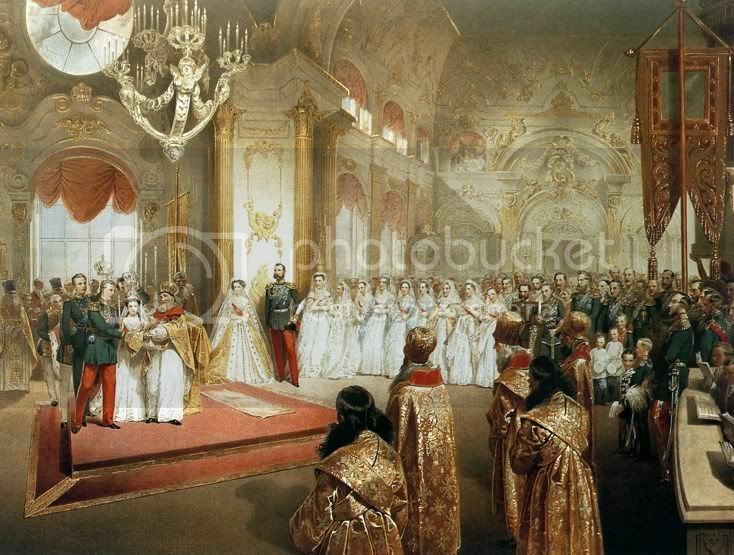 Anichkov was presented to her and Alexander as a wedding gift and they lived in the palace as Grand Duke and Grand Duchess. Even after Maria Feodorovna became Empress she preferred Anichkov to the Winter Palace. After the death of Alexander III Maria Fedorovna remained at Anichkov as Empress Dowager. After the revolution the palace was used as a children´s centre (the Pioneer Palace). 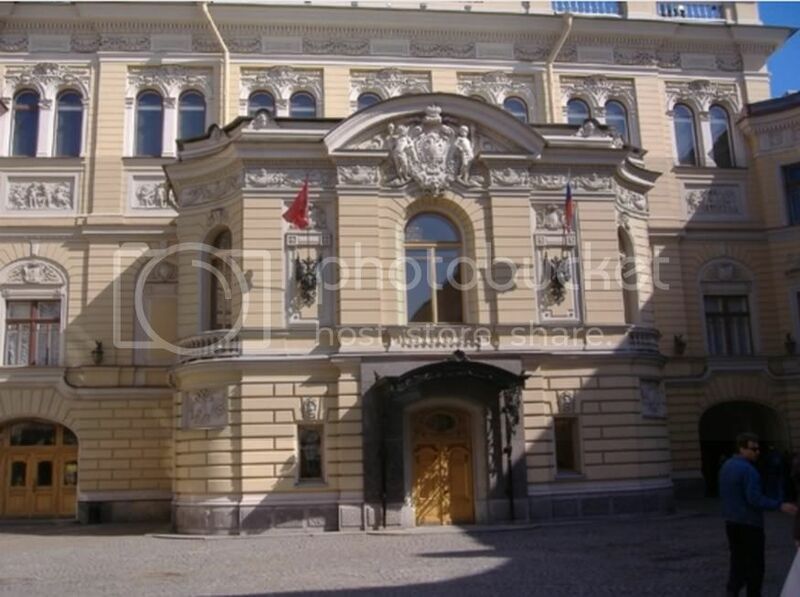 Now the palace is called the “Palace for Creative Youth” as the term “pioneer” has disappeared along with the Soviet System. 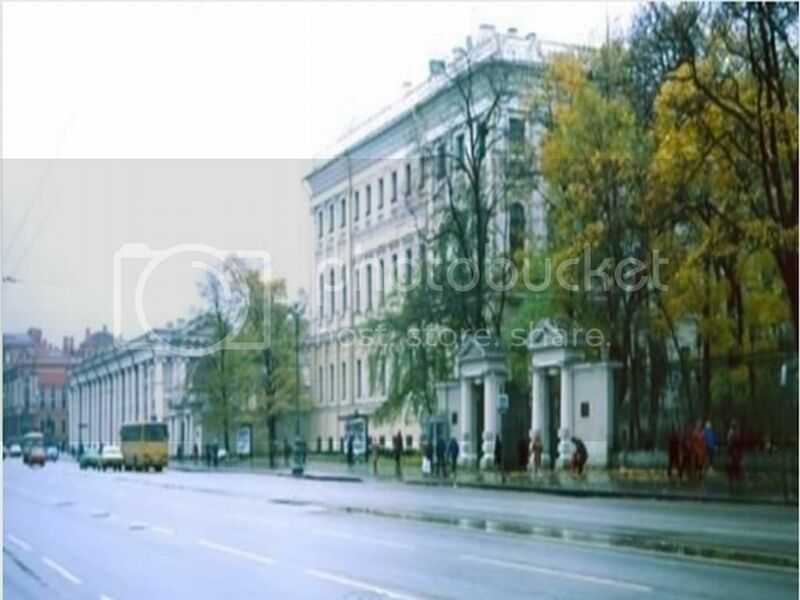 On the occasion of the reburial a photo exhibition named “Dagmar and Denmark” dedicated to Empress Maria Fedorovna will be displayed at the Anichkov Palace. The Winter Palace, founded in 1762 by the architect Bartolomeo Rastrelli, served as winter residence for the Russian Imperial Family up to the revolution in 1917. 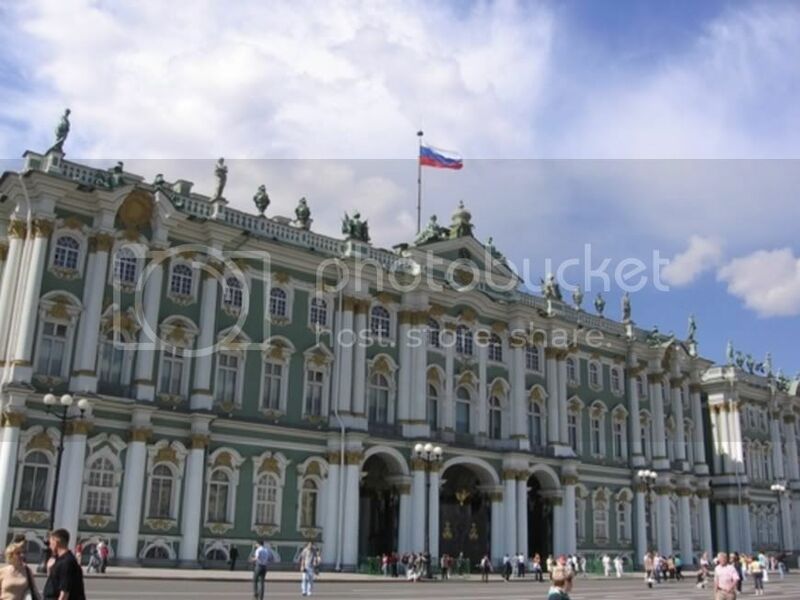 The Hermitage Museum consists of five buildings, including the Winter Palace and the Hermitage Theatre, which was formerly the Court Theatre. 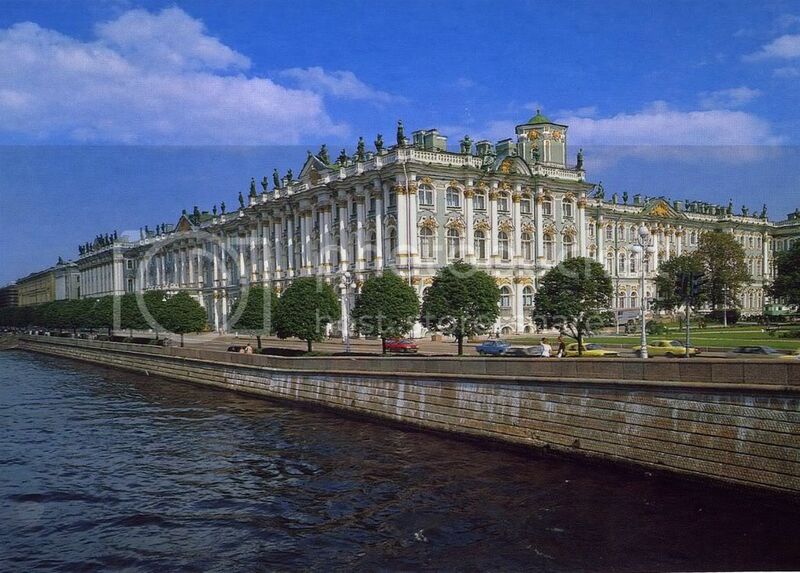 The Hermitage is considered the world’s greatest art collection including over three million art effects. Visitors to the Hermitage are at the same time able to see a number of parade halls and private chambers from the period of the Russian tsars. In connection with the reburial the Crown Prince will open an exhibition at the Hermitage displaying works of the Danish court painter Laurits Tuxen, arranged in cooperation with the Danish National Gallery. The exhibition includes several paintings from Danish collections. A painting. left, of the wedding of Maria Feodorovna and Alexander. Dagmar's parents, Christian IX and Queen Louise, did not attend Dagmar's wedding because they thought they would not be able to reciprocate the lavish celebrations of the Russian Imperial court. 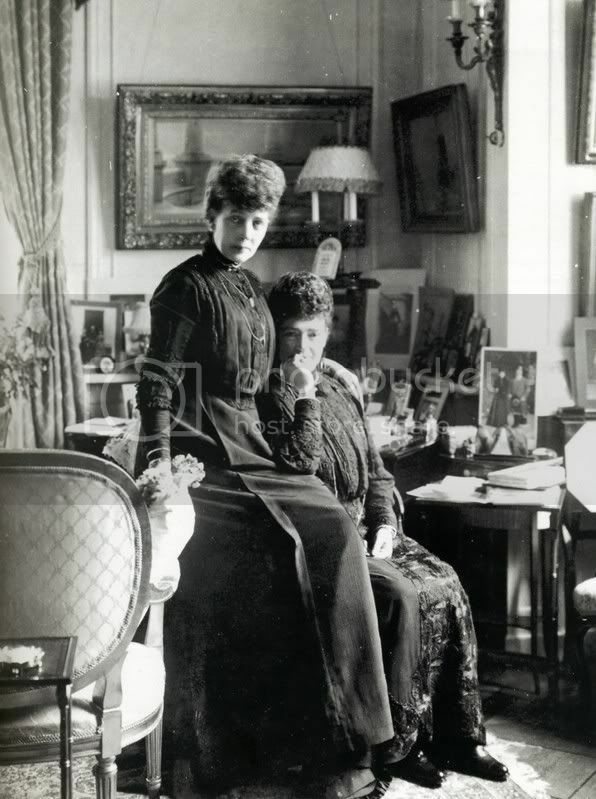 Right, Dagmar with her sister Queen Mary in their home in Denmark after Maria Feodorovna evacuated from Russia and later settled there during her last years. Hare Island and the Saints Peter and Paul Fortress. 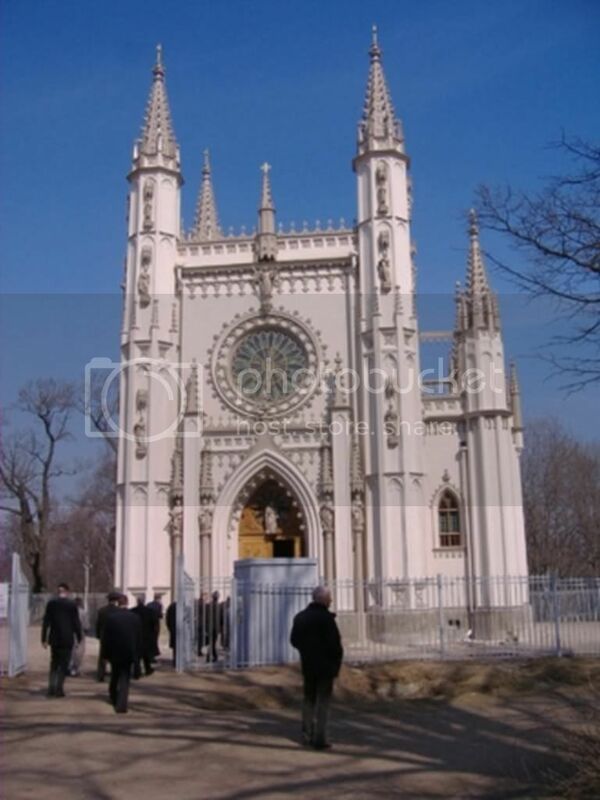 The final resting place of Dagmar, Princess of Denmark and Tsarina Maria Feodorovna of Russia. Perhaps we can say she is still connected to Denmark through the currents of the Baltic Sea which touches both places.